Mercury bioaccumulation is a local, regional and global-scale problem. The Cache Creek Watershed is one of many in California whose streams, lakes or reservoirs are on the Clean Water Act’s 303d list for mercury threshold exceedance due to historic mercury mining and use of mercury for gold mining. It is noted to be the largest contributing source of mercury to the San Francisco Bay Delta. 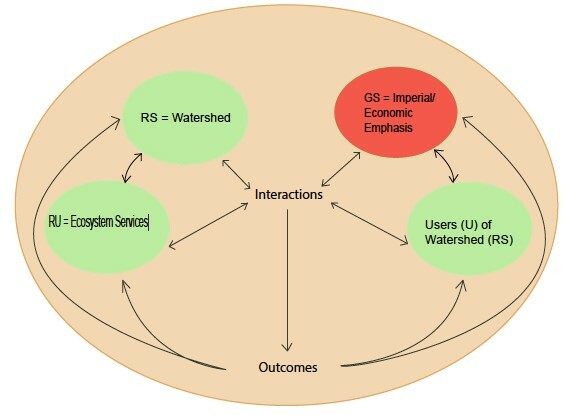 The objective of this thesis was to examine spatial patterns of mercury concentrations in ecosystem indicators in the Cache Creek Watershed, identify ecosystem services impacted and employ a Socio-Ecological Systems conceptual model to reveal environmental management mechanisms that contributed to widespread mercury bioaccumulation, and alternately, remediation. Over 92% of fish monitored from 1974 – 2013 throughout the watershed were above safety thresholds for mercury in fish for subsistence, sport fishing and wildlife. Mercury concentrations were greatest in the vicinity of, or directly downstream from, mine sites in all ecosystem indicators evaluated, including sediment, fish, invertebrates and Cliff Swallow eggs. Individual services within all four ecosystem services categories – supporting, provisioning, regulating and cultural – have been impacted. The General Mining Act of 1872 and lack of regulations were the primary catalysts for widespread mercury bioaccumulation. Support for remediation is being provided by the Clean Water Act and is requiring cooperation between state and federal water quality governing agencies and many other stakeholders at local and regional scales. This thesis presents a framework (Socio-Ecological-Systems) embedded with ecosystem services as part of the framework for evaluating land-use management and resulting ecosystem services impacts, the application of which may be useful for other mercury contamination studies.